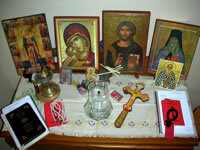 Daily prayer is essential to a healthy Orthodox Christian life. It is not an option. Why do we pray, How do we pray, When do we pray and Where do we pray are questions we address below. Christ asks us to pray. He tells us in the Gospel of Luke, How much more will the heavenly Father give the Holy Spirit to those who ask him (Luke 11:13). We pray so that God can help us to become more like Him in our actions. For renewal and the growth of our soul. To give thanks to God for all he provides for us. To seek forgiveness for our sinfulness as humility is a prerequisite for prayer. We can also pray to seek help for others as well as ourselves. But we must not forget to pray for His help in our own spiritual growth. This is not selfish, but essential for us to better love and serve others and carry out God’s commandments. We can ask also for His help in supporting us in the various ascetic practices we choose to undertake. We are asked to pray without ceasing. Here are the Scripture references to this idea. God intends our life to become one of a constant prayer where we are continually in a relationship with Him. This is our main task, to draw nearer to God. How do we do this? 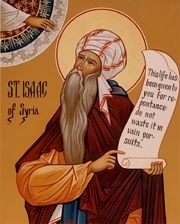 Saint Isaac of Syria reminds us that it is impossible to draw near to God by any means other than unceasing prayer. Pray with affection and tears – with joy and thanksgiving, but also with true repentance and purity. Pray with patience and ardor – ‘to deny oneself’ is courageously to persevere in prayer. Pray from the depths of the heart – even if we pray using ‘the words of another’ they should be uttered as if they are our own. St. Isaac says this is especially true of the Psalms. Pray with faith and absolute trust in God – because He knows our life. With a regular time and a special place, you are ready to begin. You begin praying by focusing your consciousness in your heart and forcibly gathering there all the powers of the soul and body. Take the time at the beginning of your prayer time to quiet your body and to concentrate your energies in your heart. Christ says, “Enter into thy closet and ... shut thy door” (Matt 6:6). Remove all activities that could disrupt your inner descent. Set aside, to the best of your ability, all of your problems of the day and your worries for tomorrow. This is not a time for thinking or worrying. When you are preparing to pray, stand, sit or walk a few minutes and steady your mind to concentrate on God. Note: When we pray we should face East. Why? When you finish your prayers, stand for a few moments. Consider to what your prayer life commits you. Try to hold in your heart what has been given to you. Treasure it for a few moments. Remember to make your prayer life one that is a firm rule and not something that is done occasionally or sporadically. It must be done each day morning and evening at a minimum. You need to have specific prayers that are part of your prayer rule. You need to commit to doing you rule each and every day. Think about certain personal hygiene tasks such as brushing your teeth that you do each day out of habit. You don’t forget to do them each day. Your prayer rule needs o become a habit as strong as these. Prayer must become a daily habit that you never forget. Prayer is essential for the health of our soul Just like the hygiene activities that we do for the health of our body. More information in Articles on Prayer. Recommend to read especially the Homilies of Saint Theophan the Recluse on Prayer.